The following is an excerpt from the book "Of Boats on the Collar" by Hilda Chaulk Murray (www.flankerspress.com), an interesting book about the rich and interesting history of Elliston and surrounding area, a typical small fishing community in Newfoundland. Highly recommended reading for anyone researching boats and ships of North America. Although may men built their stages and winter slides with just axe, hammer, saw, and perhaps a plane, boatbuilders and carpenters had a variety of tools besides the four basic ones. In an old tool box in Maberly, I discovered a variety of carpentry tools, and I remember others that are now missing. Among them was an adze, mentioned by Homer as one of the tools used by Odysseus. It was an essential tool for the boat builder. The blade of the shipwright's adze is longer and rather flatter than that made for other trades. The handle which is about 2'9" long is often given a double curve, so that its lower end is brought forward to a point almost in line with the cutting edge of the blade. the purpose of the double curve is not quite clear though shipwrights assert that it would be impossible to control an adze with a straight handle. The Shipwright's adze is used for all kinds of shaping and finishing including the trimming of curved framing and planking. One method of working is to start a cut in one direction, and then begin another cut in the opposite direction so that the cuts meet; this avoids cutting too deep if the grain runs inward. For general trimming work the end of the handle is commonly held with one hand on the knee, while the adze is hinged back and forth from that point, the curved handle lends itself to holding in this way. The "peg-poll" is used as a punch to "set" or drive spikes and nails below the surface of the timber which is being trimmed. For "shooting" (i.e. smoothing) plank they used long wooden planes about three feet long and for other sections of the boat they used smaller, special planes as shown to the right. The auger they used was one with a "windmill" bit. For taking measurements from the model, they made use of homemade compasses or dividers, and they used clamps to keep the plank in position on the timbers until they were nailed securely. Here builders may have had to borrow to have enough. Another important tool for a boatbuilder was the adjustable try square. This permitted him to work with angles other than right angles. Caulking irons of different types were part of the equipment of every boatbuilder. These all steel, chisel-like tools usually about 6-7" long are mushroom-headed and their blades are mostly flared - a shape known as fantail. Their edges are either sharp, blunt, or provided with grooves known as creases. Driven by means of the "caulking mallet," they were used to force stranded oakum into seams between planks on the deck and ship sides, to make the ship watertight. For this purpose the sides of the plank are very slightly beveled to a distance of two-thirds of their thickness, thus presenting an open seam into which oakum is forced. The outside planks are caulked in this way only in carve-built, and not when clinker-built. The seam is first opened, when necessary, with a reaming iron and the threads of oakum are then driven in with a caulking iron. The oakum is further compressed (hardened down) and sunk below the surface with a marking iron. The seam is then filled (payed) with pitch. Caulking was usually done from left to right, hardening down (with making iron) from right to left. Much experience and skill was needed to judge how much oakum should be forced into a seam; too little would not keep the water out, but too much could spring the planks apart, or even shear off a bolt or trenail. 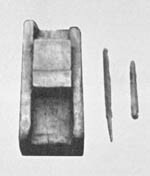 Elliston builders used at least two forms of caulking irons: the regular-shaped caulking iron described earlier, and the crooked or bent iron. The latter is fantail and about the same size, but the shank is offset. It is used for caulking in places which cannot be reached with a normal-shaped caulking iron, for example, the garboard strake, which is the plank next to the keel. To drive the caulking irons, a long-headed wooden mallet was used. The head measures about 13 inches long and 1 3/4 inches across the faces, which are circled with thick iron rings. These rings are usually made to taper in thickness from the face backwards. The long head allows for wear; the rings can be moved back when necessary. The central portion of the mallet is enlarged and oval-shaped in section. It is bored centrally for a round hand handle, one end of which is often left protruding above the head. Most fishermen-builders also had a drawing bar or nail pull. This was a heavily made iron bar two to three feet long with a hammer-like claw at one end for pulling out big nails or spikes. In the old shed in Maberly, I also found two drawing knives, a spoke-shave, several auger bits, two straight augers, a hinged measuring device, a wooden line-drawing device, thin chisels that seem to have been used for hollowing, a chisel sharpener, files, and of course a grind stone. Cutting tools had to be kept sharp. Certainly not every builder had a pit saw, because it was such a big item, but neighbors would help with the plank sawing.